ACT has aggregated national job profile Work Keys data by common occupations in high demand industry clusters. This information should be used only as a guide. Browse the WorkKeys Applied Math, Graphic Literacy, and Workplace Documents required for more than 400 different jobs. Browse the Occupational profiles to better understand the alignment between WorkKeys scores and occupational profiles. 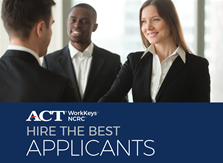 Find out which organizations are using ACT WorkKeys NCRC to pinpoint applicants with essential, verifiable workplace skills. "ACT WorkKeys assessments that comprise the WorkKeys NCRC are good indicators of a person’s learning potential which will, hopefully, lead to successful completion of apprenticeship and structured training programs for Eastman’s advanced manufacturing jobs such as industrial mechanics, chemical operators, and lab analysts." "At Eastman we want good-paying jobs and rewarding career opportunities for everyone in our community. And engaging in ACT Work Ready Communities is enabling us to work with other business and community leaders to introduce students and residents to ACT WorkKeys and the ACT WorkKeys NCRC and how it can help them take charge of their career decisions – whether seeking employment or furthering their education and training – we want everyone in Northeast Tennessee to be ready for success. I am thankful to work for a company that allows me to do that." "You have to have a starting block and the NCRC is a great first step." "WorkKeys has been a consistent predictor of successful trainability for Glen Raven." "The most significant advantage of using the ACT WorkKeys solution is validating the suitability of an employment applicant to the performance requirements associated with a position." "We used ACT WorkKeys NCRC Silver level when selecting candidates for our electrical/mechanical apprenticeship program, and not a single individual underperformed because of an inability to comprehend class materials. ACT WorkKeys was truly an asset to the success of the Maintenance Apprenticeship Program." 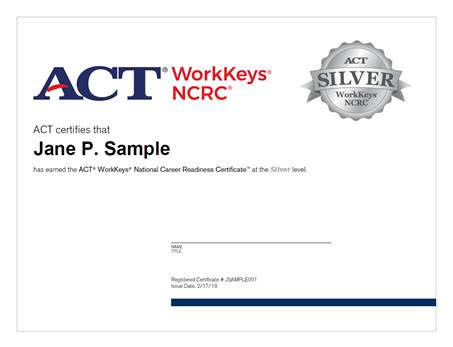 "RoyOMartin is an active supporter of the ACT Work Ready Communities initiative, having our hiring team fully trained on using the ACT WorkKeys NCRC and WorkKeys Assessments in their hiring decisions." "Without a doubt, ACT’s KeyTrain Learning Modules and WorkKeys Assessment make a significant contribution to the rigor of the WorkReadyNH program." "Over a one year period we had that model in place (ACT WorkKeys) and we reduced our turnover in half from 14% to 7% and we have remained at 7% every year." "WorkKeys assessments identify an individual’s skill levels in critical skills required for entry level positions with our company. It provides a baseline knowledge of the foundational skills of that individual and helps screen for potential job candidates, ultimately saving the company significant training dollars." "R.J. Reynolds is proud of its increase in diversity hiring since deploying ACT WorkKeys solutions. Having a skilled and diverse workforce is important to our company and our community." "R.J. Reynolds has embraced the WorkKeys system and considers it as a strong tool to identify applicants who have the foundational skills to meet our stringent hiring requirements. The fact that it is a universal system, we know that all of the applicants have met the same criteria regardless of where they were tested. This has helped increase our candidate pool to enable hiring the best of the best." "I would definitely recommend this program (ACT WorkKeys) for other employers. It allows you to focus your interviewing and your final testing of candidates on the most highly qualified candidates. It’s a huge time saver for me as the general manager and our hiring managers, that allows our team to focus on what they need to be doing which is building coaches." "When you use the NCRC as your standard, not only are you getting people who are trainable and competent, you are getting access to a pool of people who would of otherwise been shut out. We feel very excited about it,…and I just can’t say enough about the value of the NCRC to our workforce and our future." "(Using WorkKeys) we took our turnover in the initial three months from 14% on average to less than 4%. And now we are proud to say we have a turnover rate of less than 4% across the whole plant." "We have seen a great return on investment with this program (ACT WorkKeys)….I believe it’s good for employees because they already feel a part of the team when they come in, they don’t feel so far behind and their learning curve is shorter." "Having been in site selection for many years, it has always been difficult to ensure my clients that there is available, stable and reliable workforce in a community. However, in the last few years when I see that a county is ACT Work Ready I know that they are following the steps in planning for the current and future workforce. Therefore, our tendency at FCG is to look strongly at ACT Work Ready Communities for new site locations. I would encourage all communities to seek that status." "ACT WorkKeys has been a tremendous help by showing us who has initiative by successfully taking WorkKeys and achieving the scores needed to walk in the door ready to be trained to safely and effectively run a chemical plant."